Transparency Market Research has published a new report titled, “Hub Motor Market for EVs - Global Industry Analysis, Size, Share, Growth, Trends, and Forecast, 2018 – 2026”. 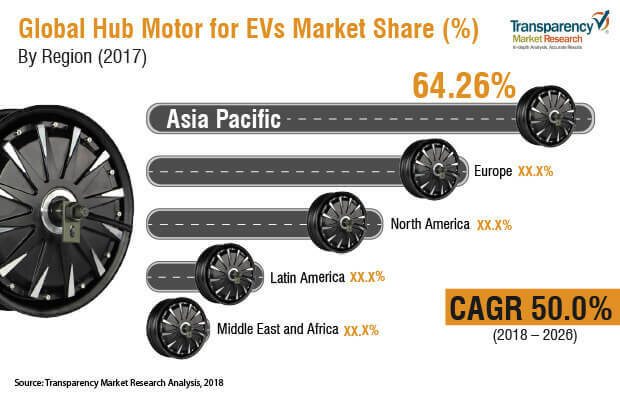 According to the report, the global hub motor market for EVs is anticipated to surpass US$ 1 Bn by 2026, expanding at a CAGR of more than 50% during the forecast period. Rising demand for light weighting of electric vehicles is expected to boost the demand for hub motors of EVs. Integration of hub motors in a battery electric vehicle (BEV) eliminates the usage of various components such as engine, transmission box, intake manifold, drive shafts, tail pipes, and fuel tank. Hub motors help increase room space and offset the weight of electric batteries, thereby improving stability. Automakers are investing significantly to develop electric vehicles due to increasingly stringent emission norms and rising consumer demands. Volkswagen is set to launch 20 electric and plug-in hybrid vehicles by 2020. Hub motors are robust and provide independent drive force to each wheel, thus improving safety with optimal torque distribution. Improvement of charging infrastructure is expected to boost the adoption of electric vehicles, thus driving the hub motor market for EVs. Demand for hub motors is considerably high in commercial vehicles as several electric bus manufacturers, such as BYD, Solaris Bus & Coach Company, Daimler AG, and Eletra, have successfully incorporated them. Europe and China have widely adopted electric buses fitted with hub motors, thereby contributing to the demand of hub motors in commercial vehicles. The passenger vehicle segment is expected to witness high demand for hub motors during the forecast period, as Hyundai, Ford, Nissan-Renault, Volkswagen, and Mitsubishi have been testing integration of hub motors in electric passenger vehicles. The less than 700 N-m segment is expected to dominate the hub motor market for EVs, as automakers are launching more number of electric vehicle models in compact and hatchback vehicles. Moreover, hub motors with less than 700 Nm toque capacity are expected to be sufficient for such vehicles. Therefore, the less than 700 Nm segment is expected to lead the market, in terms of volume. However, the more than 700 Nm segment is anticipated to expand at a higher CAGR, owing to rise in demand for LCVs and SUVs. In terms of cooling type, the water cooling segment is expected to lead the market, as it is highly effective and has extensive applications in electric buses. The air cooling segment is expected to expand at a moderate pace due to its adoption in small passenger vehicles. Moreover, the air cooling type hub motor eliminates the need for hoses and other cooling components, thereby simplifying the system. Operation of public transport electric buses with hub motors in Europe has led to the significant market share held by the region in the global hub motor market for EVs. Several key players such as Protean Electric, Elaphe, and e –Traction B.V., have manufacturing facilities in Rest of Europe. China is expected to lead the global hub motor market for EVs. China witnesses a high rate of adoption of hub motors with their extensive usage by BYD and Ankai bus manufacturers. Auto manufacturing startups, such as Changchun Fawsn Auto Tech, are expected to manufacture 300,000 vehicles equipped with hub motors by the end of 2023. Key players operating in global hub motor market for EVs include Protean Electric, ZIEHL- ABEGG, Schaeffler Technologies AG & Co. KG, Bonfiglioli Riduttori S.p.A., ZF Friedrichshafen AG, Elaphe Ltd., HEINZMANN GmbH & Co. KG, TM4, Evans Electric, Siemens AG, Kolektor, Printed Motor Works, NSK Ltd., NTN Corporation, GEM motors d.o.o., Magnetic Systems Technology, e-Traction B.V., Hyundai Mobis, and YASA Limited.